Resources found in the reference collection include dictionaries, encyclopedias, atlases, handbooks, bibliographies, indexes, and other reference books in all subject areas. Reference books are useful for looking up quick facts, definitions, statistics, biographies, and general topic overviews. 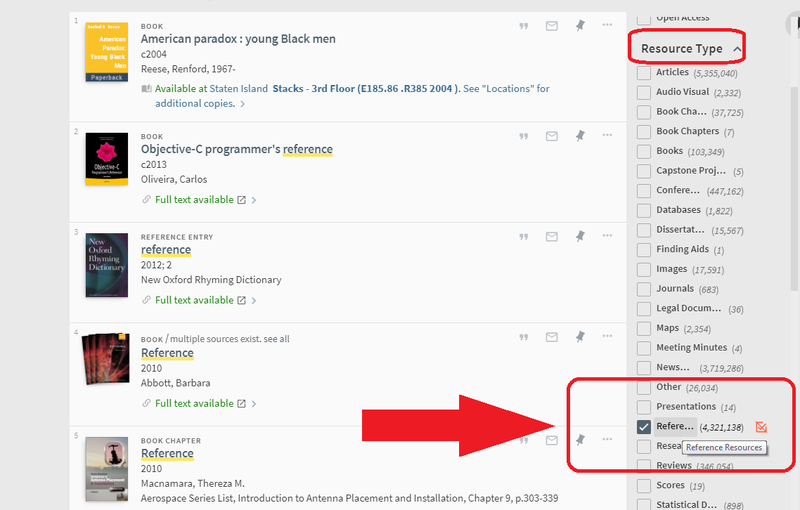 You can locate reference books on OneSearch, using the navigation on the right hand side of the results page locate Resource Type > select Reference Resources. This will refine your search to reference material, available both in-print and electronically. Most of our reference books are available electronically. Some of our printed reference books are located in the first floor reading room just beyond the Reference Desk and in the 3rd Floor Stacks. Many reference books are non-circulating, which means they cannot be checked out. << Previous: How do I find a journal?